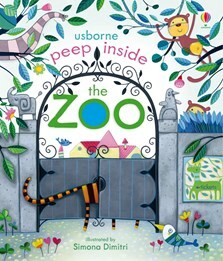 Peep under leaves and behind doors to see the animals in the zoo in this delightful flap book for young children. With flaps and holes to peep underneath and through, noisy parrots, cheeky monkeys, very tall giraffes and lots more are revealed. Sure to become a firm favourite for young animal lovers. This is perfect. Most pages have more than one flap, which kids love of course and simple, factual information is found beneath. I have 'Peep Inside the Garden' book too which is just as good.